The Sheep Whisperer: Gorilla Gusto! 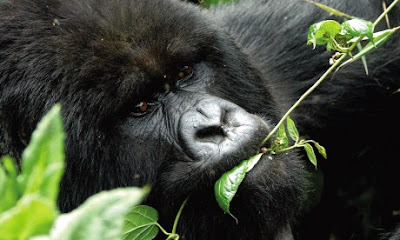 Mountain Gorillas are organized in troops of up to 30 individuals. 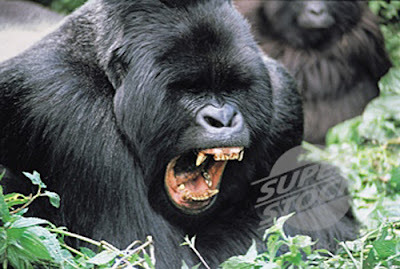 They are led by a dominant, alpha adult males, known as a Silverback. Silverbacks get their name from a swath of silver hair that grows on their backs as they mature between the ages of 11 - 13 years of age. Silverbacks are the biggest & strongest adult members of the troop, & will defend their troop in a variety of rather dramatic displays. These include charging, pounding their chests, hooting, barking, & unleashing horrific roars, all clearly communicating to any intruders the need to stay away. "I'll Huff, & I'll Puff, & I'll Blow Ewer House Down!" 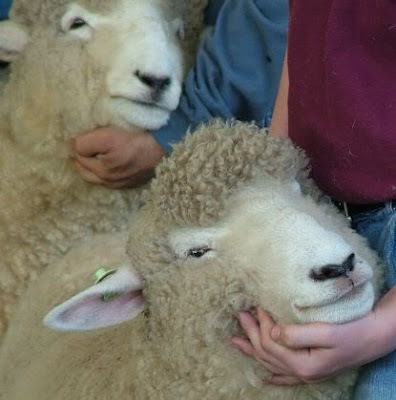 What Ewe have to ask ewer-self is, "Are Ewe Feeling Lucky?" 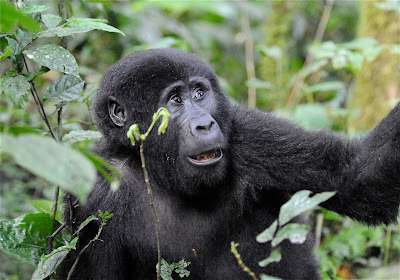 Silverbacks lead their troops in a typical 15 square mile area in the thick-forested mountain regions of central & western Africa. They organize troop activities such as moving to a new forest, eating, & nesting. The troop consists of several males, a few females, & their children. The sheer physical superiority of the adult leader warrants thoughtful consideration of any younger male looking to challenge. NO! This is NOT a Boy Scout troop on a Jamboree! I "Promise" Ewe that I didn't eat Ewer Breakfast! Ewe have to believe me! 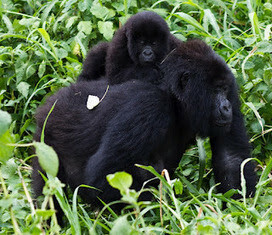 Mountain gorillas live in a relatively gentle, calm, & non-aggressive environment , unless of course they feel threatened. They are omnivorous, enjoying a mostly vegetarian diet of shoots, roots, wild celery, pulp, fruit, & tree bark, mixed in with grubs, termites, ants, larvae, & worms. 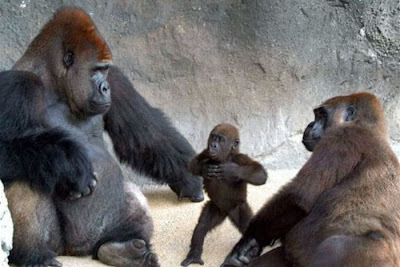 Adult males grow up to 6 feet tall, weighing over 400 pounds, & averaging twice the size of the adult females. 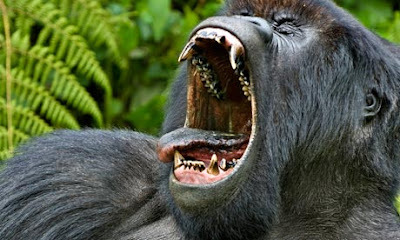 The lifespan of the Mountain gorillas is 40 yrs. in the wild, & 50 yrs. in captivity. They remain an endangered species, with only about 700 left on the planet. Sorry, but I'm a little "camera shy"! Don't count us out! We're making a comeback! 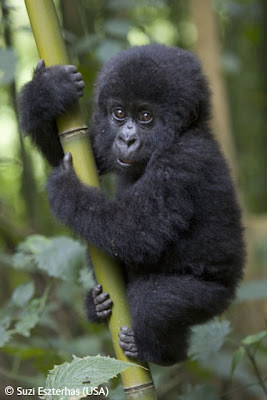 Mountain Gorillas can climb trees & the lighter gorillas often nest in the trees to sleep. 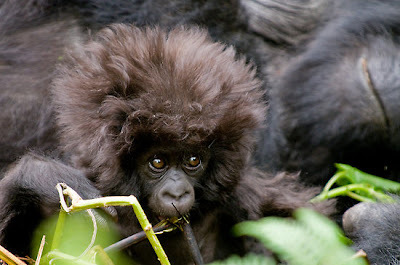 Heavier gorillas nest on a self-made nest of leaves on the ground. Females give birth to one infant every 3-4 years after about a 9 month pregnancy. The infant weighs 4 lbs. at birth, & is very dependent upon its mother. They actually ride their mother's back, clinging to her fur, from 4 months through up to 3 years of age. The youngsters enjoy playing, tumbling, running, & playing "King of he Mountain", under their Mom's watchful eye. Don't Ewe worry Mom, I got Ewer back! I couldn't do anything with my hair !Can Ewe tell? I communicate with my facial expressions! Sheep like to gather in flocks, & prefer the safety provided in numbers. 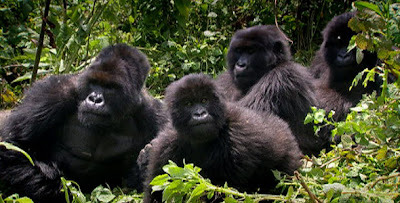 This is similar to the Mountain Gorilla's formation of troops. Gorillas also have Silverbacks as a dominant leader to lead their troop, while Sheep have a dominant ewe as a leader of groups of sheep. The advantage in leadership goes to the sheep, however, because they have a Shepherd protecting & watching over them. I Know the Shepherd loves Me! Ewe can just tell! Walk securely today, with the confidence that comes from trusting in the Shepherd to lead & protect Ewe throughout Ewer day! Blessings! "The Lord is good, A stronghold in the day of trouble; And He knows those who trust in Him."